If there are two automotive trends that Americans are obsessed with, it is Jeeps and crossovers, but nary the two shall meet, right? As someone who works in the off-road industry (as my full time gig), I can tell you most Wrangler owners don’t want to have anything to do with the Renegade. “It’s not a real Jeep,” they’ll say. Let’s get this straight: The Renegade will never be a Wrangler; it was never supposed to be. However, the more Renegades Jeep can sell, the more likely it is the company will continue to finance the uber-niche Wrangler. OK, well I’m glad I got that off my chest. To me, the Renegade is one of those vehicles I've been looking forward to since I heard rumors of a “baby Jeep” a couple years ago. We immediately thought it’d be a Fiat Panda. Then we figured it’d just be an all-wheel drive Fiat 500L. Well, it’s neither. Its larger than the European Panda and more capable (and better looking) than the 500L. Jeep did a great job designing this little rig, which is sold in a host of countries around the world, not just North America. And I’ll tell you this: It’s likely going to be a huge success. 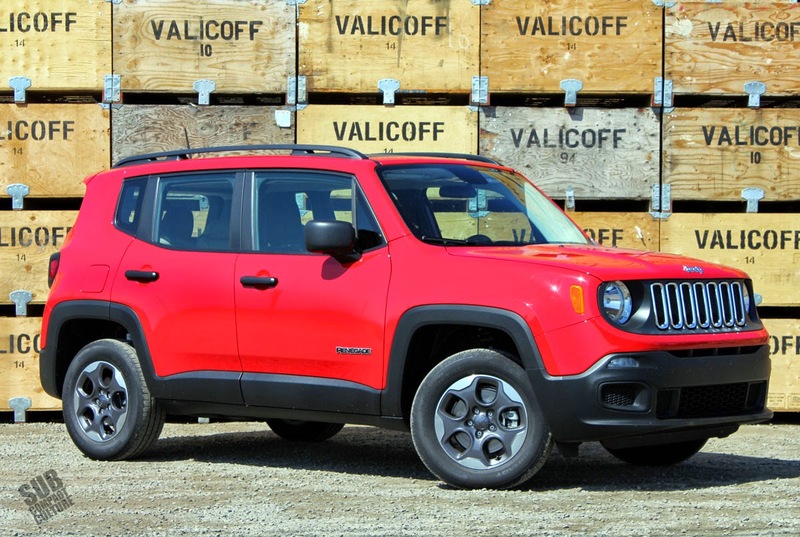 Despite the Jeep brand having an image almost as American as the Statue of Liberty, the Renegade is actually made in Italy. (Hey, the Statue of Liberty was made in France.) 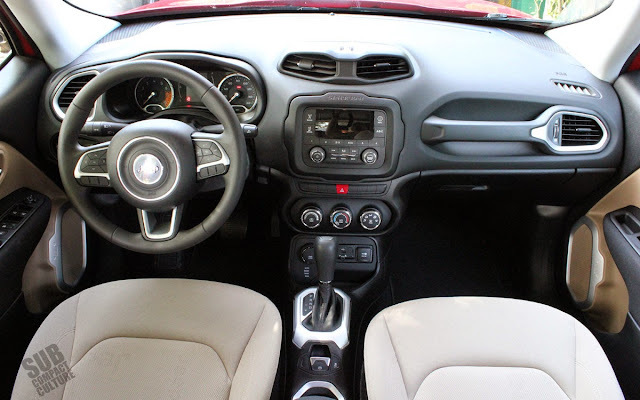 It’s manufactured on the same line as both the dowdy (albeit super practical) Fiat 500L and the Fiat 500X, which is essentially a mechanical twin of the Renegade. Think of it this way: The Renegade wears blue jeans; the 500X wears khakis. They’re both pants, but with different looks. 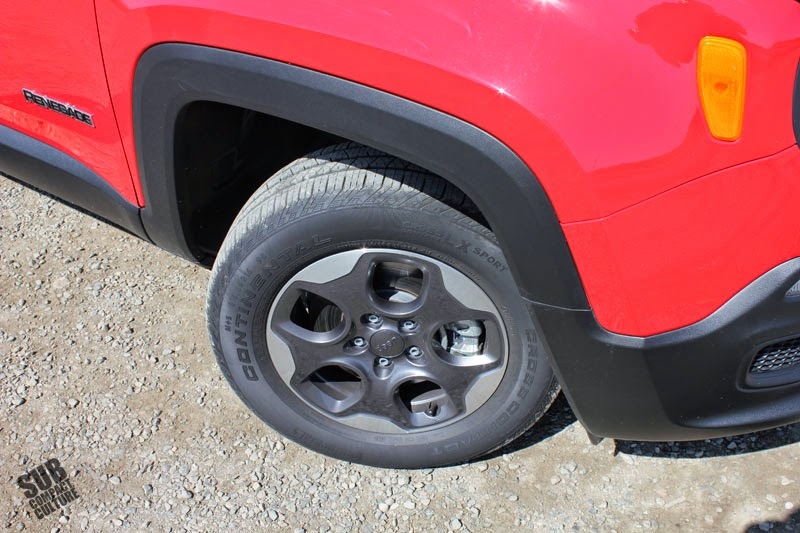 Nearly all of the Renegade’s attention in the media has been focused on its Trailhawk trim level, which offers up most of the off-road goodies. 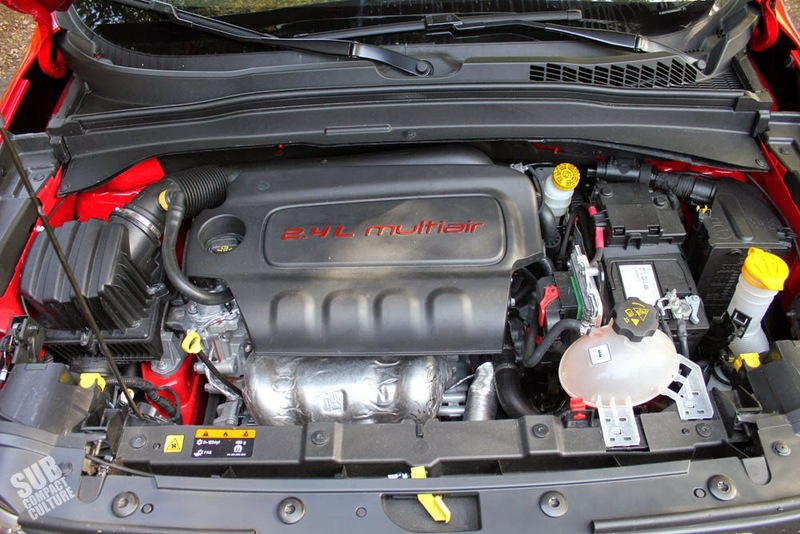 Our tester, however, was the entry level Sport trim, although it was equipped with the optional SOHC 2.4-liter Tigershark engine and nine-speed ZF transmission that’s standard on the Trailhawk. Yes, the Renegade is available with the 1.4-liter MultiAir turbo engine and a six-speed manual in Sport guise, but our tester had the more powerful mill. This Sport model comes in either front- or all-wheel drive; our tester turned all four wheels. I’ll admit when they delivered the Renegade to me, I was surprised not to get the Trailhawk. I figured they’d provide media the top-of-the-line models, which is often the case with review vehicles. But I actually like getting the mainstreamer model; the trim package the majority of people buy. I will say the first thing that struck me about this Sport model were the tiny looking wheels and tires. At first glimpse, the car (can I call it a car? ), which was equipped with 215/65/16 tires and optional alloy wheels, looked like it skipped multiple leg-day sessions at the gym. It took a little while to get used to, and I’m not 100% sure I ever truly warmed up to its scrawny shoes. My co-worker came over and asked if I could throw on the 235/75/15 mud-terrain tires from my Suzuki just to see what it’d look like. Unfortunately, the answer was no—wrong bolt pattern. Despite its small looking rolling stock, our Colorado Red Renegade has a unique style that looks like a cross between a Kia Soul, a tackle box, and hiking boot with the iconic Jeep grille and round headlights. 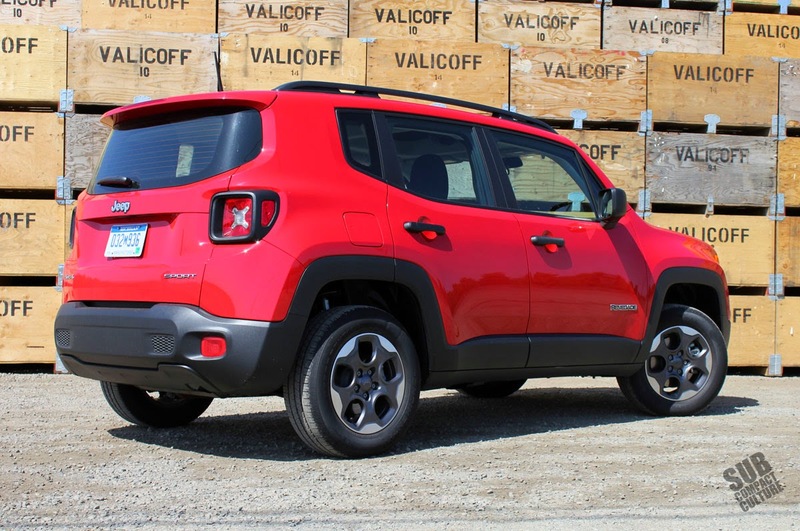 Clearly, the Renegade, which is also available in front-wheel drive, will be on the shopping list of those looking at the Soul, the Chevrolet Trax and Buick Encore, as well as vehicles like the Subaru XV Crosstrek and the Nissan Juke. It, however, will never be mistaken for any of them. There are little hidden treasures, aka, Easter eggs, all over this thing. 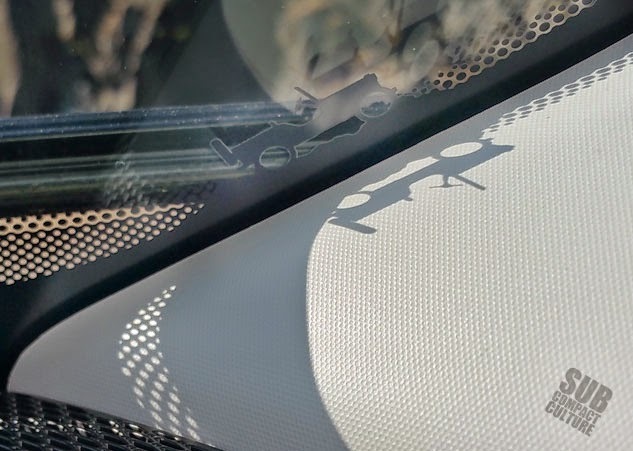 From the little Jeep grille emblems in the head- and taillights, to the little WWII-era Jeep driving up the window frame. There are topographical maps at the bottom of the cup holders; it says “Since 1941” on the radio bezel. 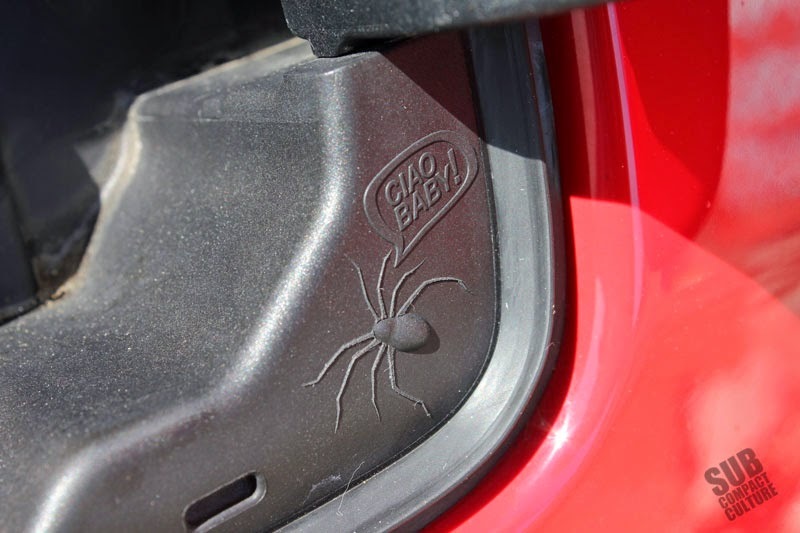 My favorites are the embossed phrase around the ignition that reads, “To new adventures!” and the little spider behind the gas filler door that says, “Ciao, baby!” I have no idea what the hell that is supposed to mean, but it’s fantastic. Also of note, instead of a traditional red redline on the tachometer, they use a splattered mud graphic. I love it. 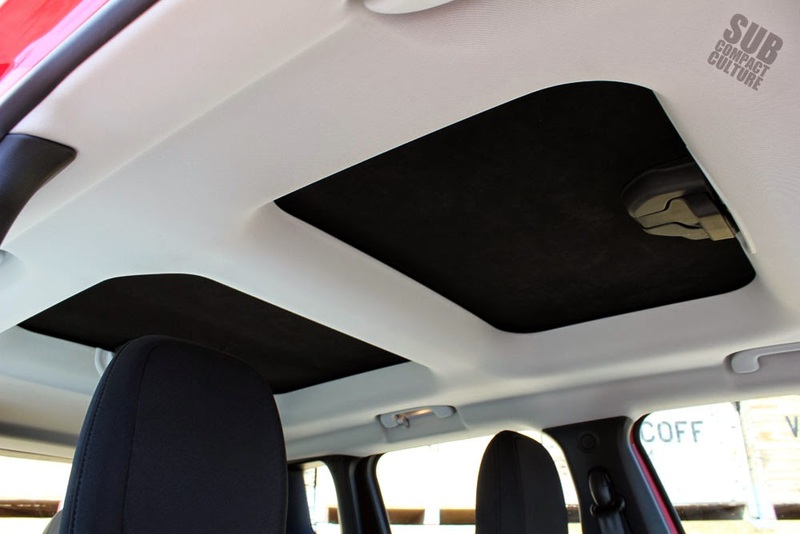 Another bit of fun is the optional My Sky roof, which features two panels that can be removed for top-off fun. There’s a key that unlocks the panels so people can’t open the roof, presumably, while moving. They don’t tilt and aren’t powered (that is an option), but they can be fully removed and stowed in the soft case located in the cargo area. The case is secured with d-rings and can also be removed from the vehicle for safe keeping. Taking the panels out is pretty simple. Putting them in isn’t as easy. There are a couple of latches and some finessing to get them aligned, and then you go back inside and secure them. With both panels off there is significant wind buffeting at highway speed. We had to lower two windows to get it to go away. 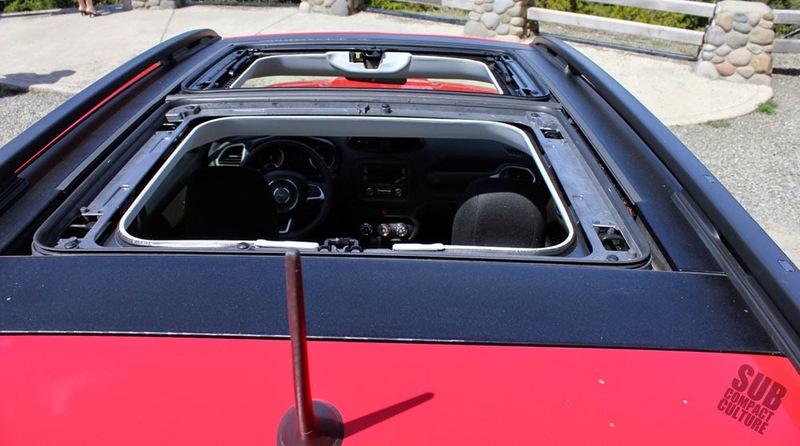 Regardless, having the open roof on a sunny day was great—so long as you don’t have to quickly put the tops on during a rainstorm. The interior feels smartly designed and well put together. The two-tone black-and-tan upholstery (with the word “Jeep” under the fabric) looks sporting and feels durable. The front seats are fairly flat, but decently comfortable and have an extremely upright seating position, although more than one person complained about the headrests being too far forward and hard. The steering wheel has both tilt and telescoping ability, which helps with finding that just-right driving position. The rear seats aren’t huge, but do have adequate space. The cargo area is quite big for the size of the vehicle and it’s mildly modular. You can move the package shelf up or down for more room or to hide small amounts of cargo. The gauge cluster is easy to read and features a multi-function trip computer with tire pressure, fuel economy, and more. The rest of the dash is also very easy to use. 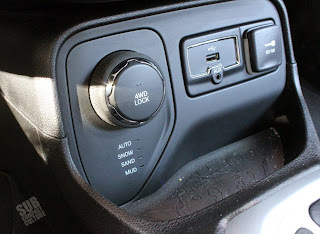 The stereo does not have a CD player, but does have both auxiliary and USB inputs. You know what it didn’t have? Bluetooth. There was no wireless connectivity on our Sport model, which was surprising. I’m somewhat amazed this isn’t standard equipment nowadays (it is on Hyundais and Kias). It did have a very rich bass-filled stereo system, which sounded like it must’ve had a subwoofer somewhere. I don’t know if this is the basic stereo or if it was an upgraded unit, but was good. There are also steering wheel-mounted audio controls. Also of note: auto down on all of the windows (including the rears). Pop the hood (which oddly, has two hood latches; one left and one right) and it looks like, well, a European car. From the fluid reservoirs to the safety labels, it’s obvious the car was made in Europe. 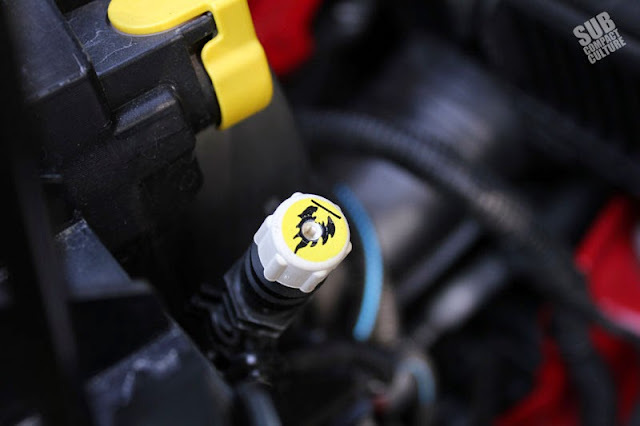 Once you close that hood and get underway, the 2.4-liter Tigershark engine, which makes 180 horsepower and 175 lbs/ft of torque, feels unexpectedly smooth and peppy. It revs with ease and doesn’t make too much racket, either. Strangely, it’s the same engine found in the Dodge Dart GT we tested last year, and I don’t recall it feeling nearly as lively or refined. The transmission has the same amount of gears my bicycle had in the 1980s (if you include reverse), and it offers up plenty of smooth gear changes. However, it did seem to hunt for the right gear every now and then, almost like it couldn’t make up its mind. And despite its nine forward gears, that final gear is only visited at higher freeway speeds. Power is sent to all four wheels courtesy of a multi-mode AWD system that Jeep calls Active Drive, which does feature a locking center differential. 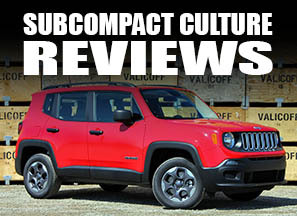 (It does not get the decent control or 4WD low feature like the Trailhawk.) With this system, you can simply leave it in the automatic setting, or turn the dial to mud, snow, or sand for different off-pavement performance. I tried out a couple different modes on steeper dirt roads and they would hold first gear longer than in auto. The Renegade handles better than I would’ve expected. I said the same thing about the Fiat 500L, too. And since they share the same chassis, I guess I shouldn’t be surprised. That’s not to say the Renegade is a sports car; the touring tires nix that as does the fair amount of body roll. Granted, that roll felt controlled and composed. Brake and steering feel are both better than I would’ve expected. Both have good modulation and weight. We did notice a fair bit of wind noise at highway speeds, but nothing intrusive. With a fully independent suspension system and fairly tall 65-series tires, the Renegade rides comfortably and really eats up broken pavement and large bumps. We took some rough forest service roads around Mt. St. Helens, and the ride never got sketchy. Moreover, we also took the car on some gravel roads to a winery and traction was never an issue, even when pushed. The skid control system would come on to correct any sudden changes in yaw. If you were to take this on a long trip with lots of gravel roads, be aware the car does not have a spare tire, only a can of fix-a-flat and a compressor. This certainly popped into our mind as we were in the farther reaches of Mt. St. Helen’s forest lands. 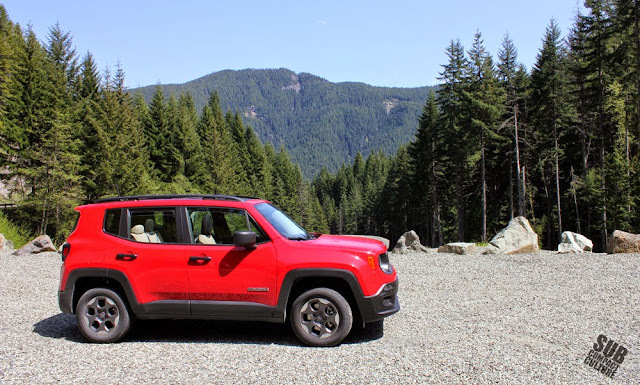 We put over 400 miles on our Renegade and felt the car was solidly built, capable of carrying a weekend’s worth of gear with ease, and rugged enough to take bumpy and broken pavement and dirt roads. And frankly, that’s all most of these little CUVs will ever see, anyhow. Our current favorite in this category is the Subaru XV Crosstrek. But the Renegade is quite a bit more powerful and felt like it had a slightly more rigid chassis and quicker reflexes. Our tester wasn’t too far off of the Crosstrek’s class-leading fuel economy, either. Rated at 21 city, 24 combined, and 29 highway, we averaged about 27 in mostly highway driving, but were able to hit just a tick over 30 mpg on one of our fill ups. Cost? It was a very reasonable $25,570 including destination. This is totally on par with other crossovers. Opt for the manual with the 1.4-turbo and you can knock $1,200 off that price. It’ll never be a Wrangler; it was never intended to be. But this Fiat/Jeep collaboration hits the nail right on the head, even in the lower Sport trim. It is function, form, and image all rolled up into a versatile package. 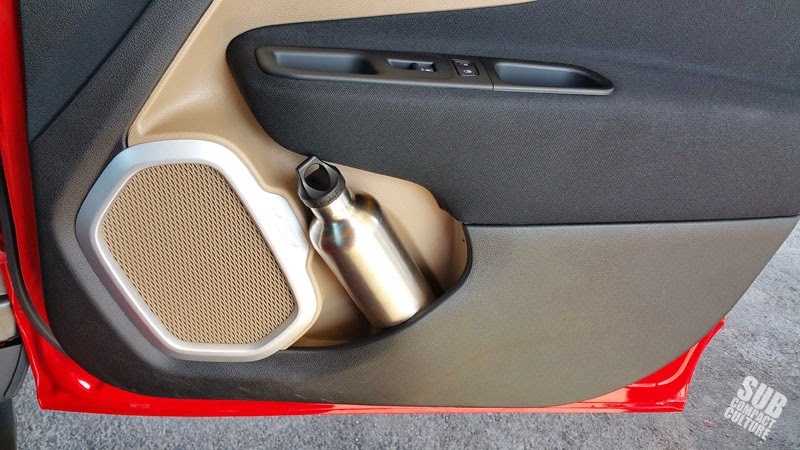 The Renegade's interior door panel is big enough to fit a metal water bottle. 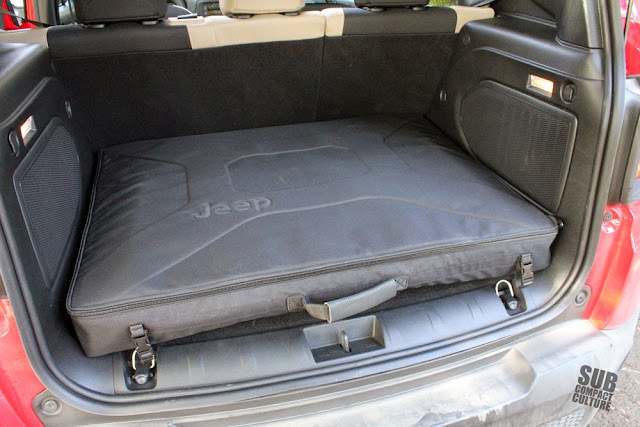 The My Sky roof case takes up most of the cargo area, but can be taken out of the vehicle. The Renegade's fun redline indicator on the tachometer. 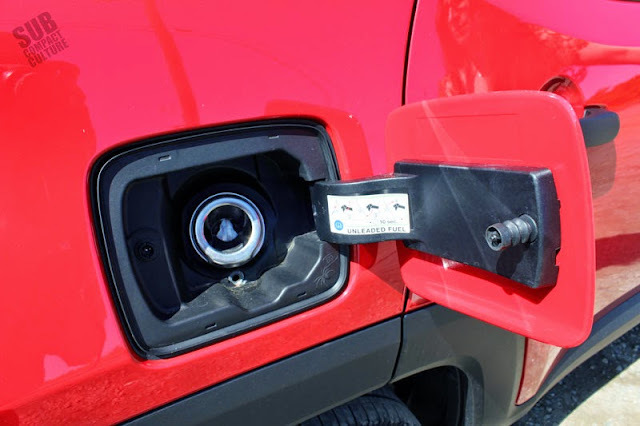 The Renegade has a capless gas filler. The My Sky roof from the interior. I have no idea what this is for, but it was in the engine. Jeep Willys Easter egg, which is driving up the windshield. 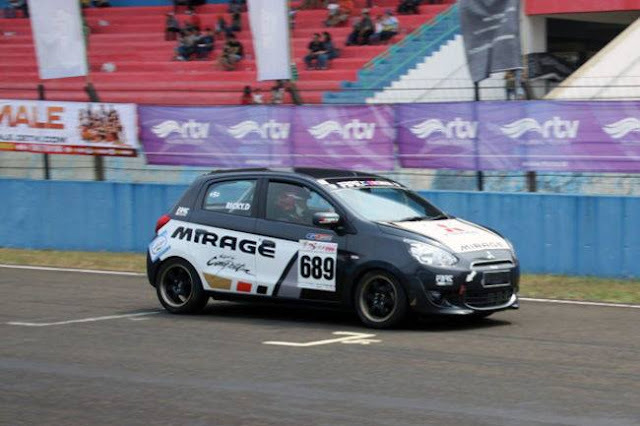 Nice review, but drum brakes in the rear can't be right? I think it is vented rotors in the front and solid rotors in the rear. You're 100% right. Thanks; I edited it. 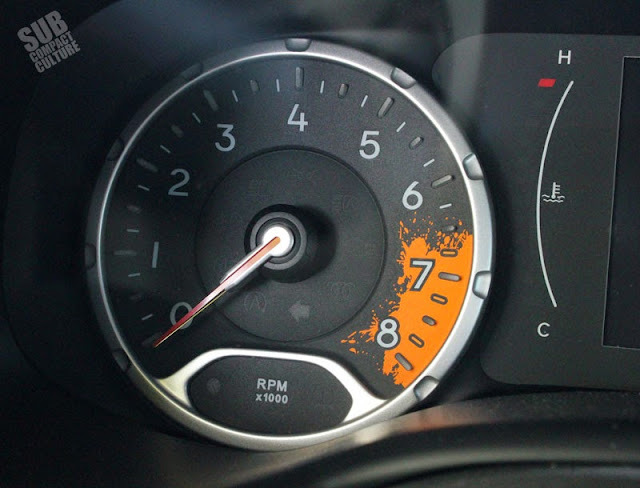 Is the tachometer spatter an example of how Jeep has "loosened-up", or another example of hour Jeep can screw something up.